Today we have released our largest update to Mob-Arena in MONTHS! It's way too hard to summarize all the changes here - you better try it out yourself. 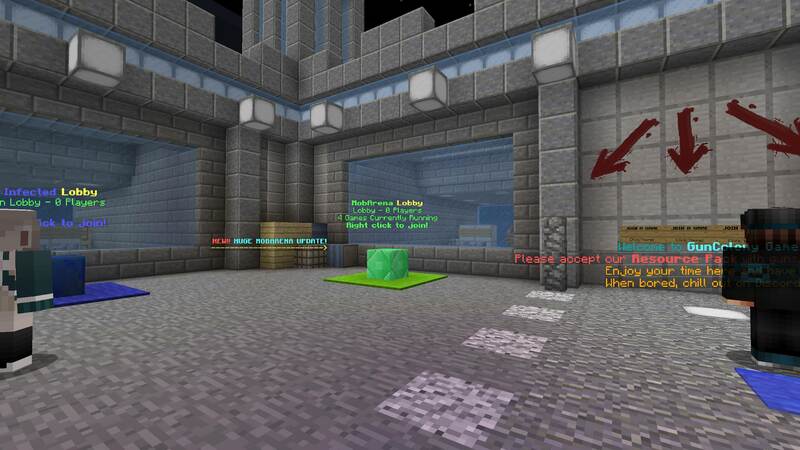 In addition there were also some quality of life changes and bug fixes to other parts of the server. One thing from the earliest days of GunColony that I have always wanted back was the bundled weapons and classes. 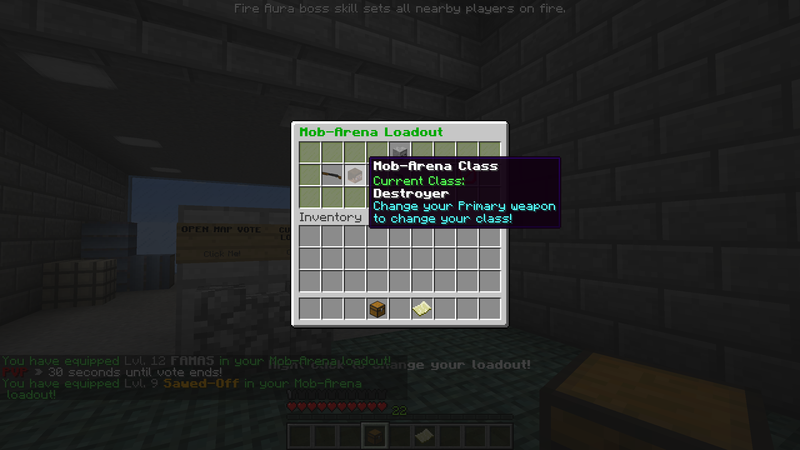 Mob-Arena classes used to each come with their own weapons, and this way it was much easier to balance them. Today I have done the best I can to recreate this mechanic. 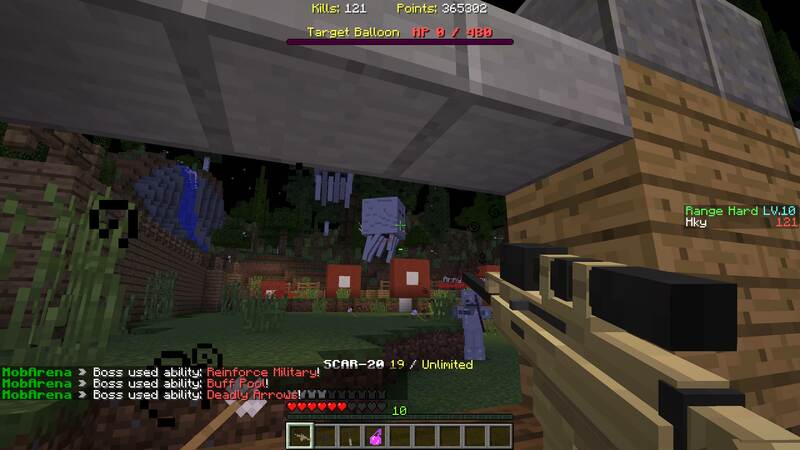 Now, the primary weapon you bring into battle decides your player class in Mob-Arena. There are now over 30 unique Mob-Arena classes in the game, and some of them contain unique goods - Kit-PvP style healing mushroom soups, nausea-inflicting potions, and poison bows are just a few examples. Also, in general, better classes will come with worse weapons, so in order to get the fullest advantage out of these new gears, you might have to sacrifice some firepower. The final two maps, Blackheart and Range, have been updated - now features like staggered spawn times and boss minions are finally available in every Mob-Arena map. Oh, and if you're on Range, careful! There might be ambushes. Those monsters always find a way to get behind you. Mini-bosses can also spawn in regular waves now. Large Fireballs - the boss fires multiple large fireballs. The amount fired depends on amount of players and game difficulty. 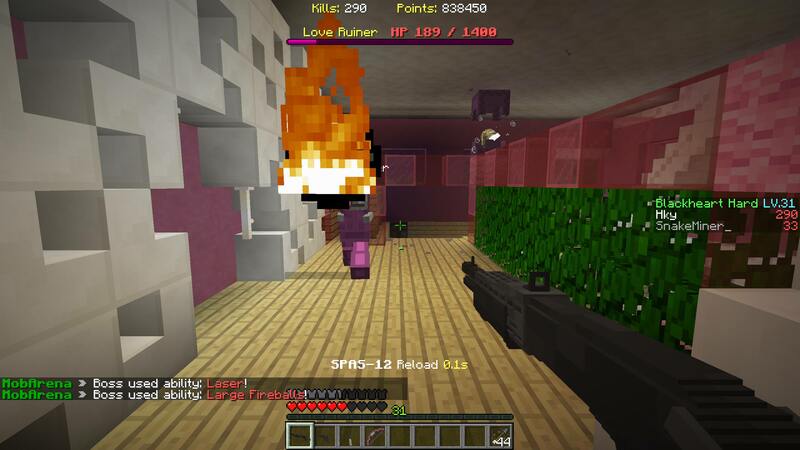 You can deflect these fireballs just like the ones from a ghast. Wither Skulls - the boss fires wither skulls. The boss will fire much less wither skulls than fireballs, but you can not deflect them and they are more powerful and much harder to dodge. Slime Cannon - the boss fires a slime at a nearby player. The slime is invulnerable to damage and knockback for 0.5 seconds. On Hard difficulty the slime is replaced with a magma cube. Bomb Cannon - the boss fires a TNT at a nearby player. The TNT explodes much faster than the ones in Throw TNT, and even faster in Hard difficulty. However, there is only one bomb so it is somewhat easy to avoid. Shockwave - the boss fires a shockwave of explosion particles. Any players hit will be dragged towards the boss, and the boss will target them. Gas - the boss throws several lingering poison potions. The amount of potions depends on difficulty. Avoid the poison or you will easily take 5 hearts of damage. Buff Pool - the boss throws several potions with positive effects. The potions affect both nearby monsters and players. Back Leap - the boss jumps backwards away from nearby players. The creeper produced by the Wall skill now has its name display always on, and now has a 60% damage protection for 1 second so it is no longer possible to simply kill it by brute force before it explodes. The laser produced by the Laser skill now travels faster and further, and has a bigger hitbox. The Bombard boss skill now works again, and the amount of damage potions it throws has been reduced for balance. A sound is now played to notify players at the beginning of a boss wave. 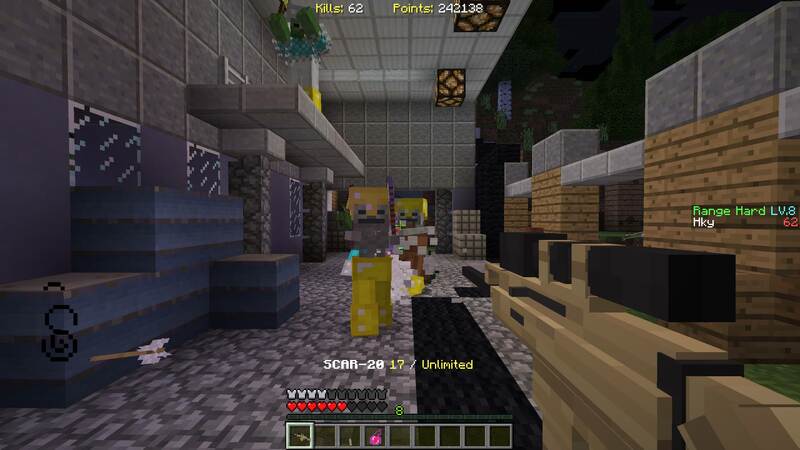 Rebalanced weapon damage system: both mob health and gun damage have been cut in half. The reduction in mob health allows explosions (from boss skills or creepers) to be much more useful against mobs, and any healing (from witch potions, or Instant Damage potions on undead mobs) to be much more significant. What are you waiting for? Check out Mob-Arena now! - I was very pleased after seeing the loadout changes you stated in the patch notes, but after seeing the quote "There are now over 30 unique Mob-Arena classes" I became a little skeptical, but It was understandable for the reason of balancing all the game. However after seeing the changes in person I wanted to inform that the system is greatly flawed in execution and needs changing. 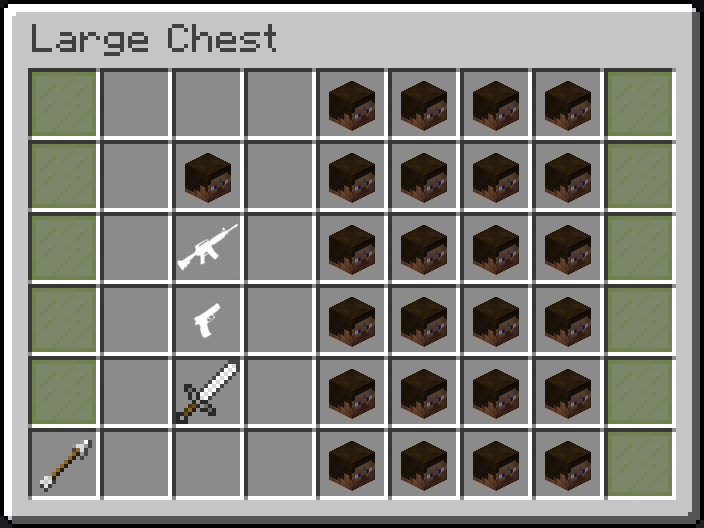 - All of the weapons in the weapon selector GUI and the classes with them are in a random order in a non-orderly fashion. 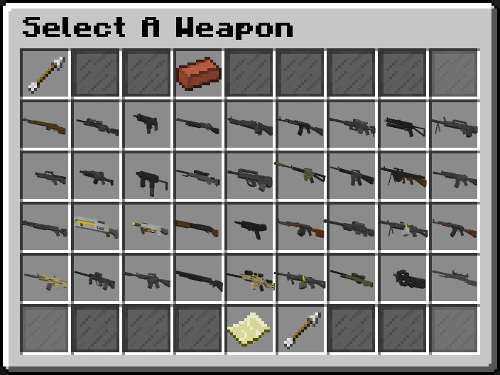 I suggest to sort and group all of the weapons based on their class and have them neatly placed in the GUI that it would be easy for players to understand and to select the class they want to play with. - One last thing is that the GUI's for the MA and Infected loadout selectors need changing. Sorry to be rude, however the fact is that they look terrible and need a redo. I made some GUI designs that you may use. The first picture consist of 3 loadout presets the player can use with the 2nd picture having a class selector with the head atop of the weapon icons being the currently selected class. The two weapon icons are the weapons currently being used with the class and the heads representing the different classes. My thoughts behind this update was to make the classes as diverse as possible - after all in the early days every weapon had its own class. So I don't think reducing the number of classes is a good idea. However I do agree with the fact that the GUIs could be sorted better. Perhaps I can make the class finder "classes first" - first you can look through a list of classes with the option to preview each of them, and after you select the class you can then choose which weapon to use with it from a small list. Also another part of the reason why there are so many classes is that I wanted to assign stronger classes to relatively weak weapons so the game balance is somewhat better in the end. 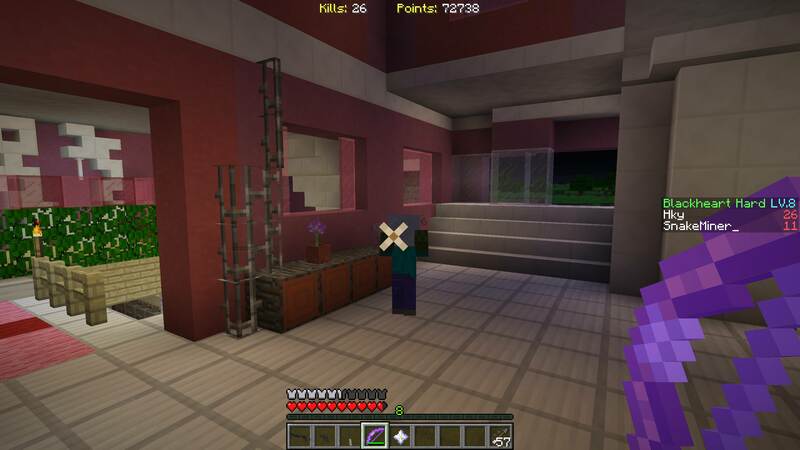 "The creeper produced by the Wall skill now has its name display always on, and now has a 60% damage protection for 1 second so it is no longer possible to simply kill it by brute force before it explodes." Then... can you at least tweak the damage a bit less then? You're supposed to run away from it not shoot it... Or maybe not let the wall hit you in the first place. I've added a feature to preview the Mob-Arena class of a weapon, and I've also sorted the primary weapon selection screen by the name of the MobArena class so it's much more obvious which weapons share the same class. I think the system is certainly in much better shape now. You don't "run".... Isn't that attack guaranteed to deal damage since you get slowed down or something? Because I thought this boss attack was worse than Rainbow 6 bombers.